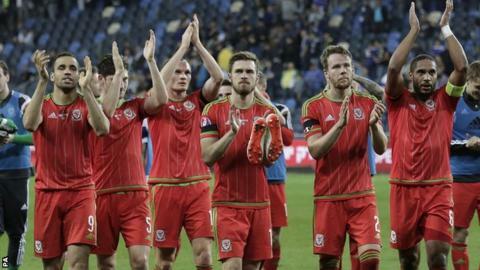 Wales' highest-ever world ranking is a 'positive' but there is 'a long way to go' in qualifying for Euro 2016, says assistant coach Osian Roberts. Wales have climbed 15 places to 22nd in the latest standings released by world governing body Fifa. "We'll take that but we also know that the hard work is still ahead of us," Roberts said. Chris Coleman's side are unbeaten in their Euro 2016 qualifying campaign and lie second behind Belgium in Group B. "We won't be getting too carried away with the rankings but it indicates that things are moving in the right direction. "It's another positive for the squad in our campaign. But we also realise we've got a long way to go." Wales' previous best ranking was 27th, when Terry Yorath's Wales side just failed to reach the 1994 World Cup, but in March 2011 they were as low as 116th. Coleman's side topped Group B after beating Israel 3-0 in March but are now second on goal difference behind Belgium, who they face at home in June. Wales have won three and drawn two of their five qualifiers so far and have only lost once in 10 internationals. They face Cyprus away on 3 September and host Israel three days later, before games against Bosnia-Hercegovina away and home to Andorra in October. "We understand there are tough games still ahead of us," Roberts told BBC Wales Sport. "We've given ourselves a foundation to build on but we've got to build on it and the game in June is as far as we're looking. "If we keep getting things right on the pitch and keep picking up points then the rankings will make for pleasing reading for a few more months to come."